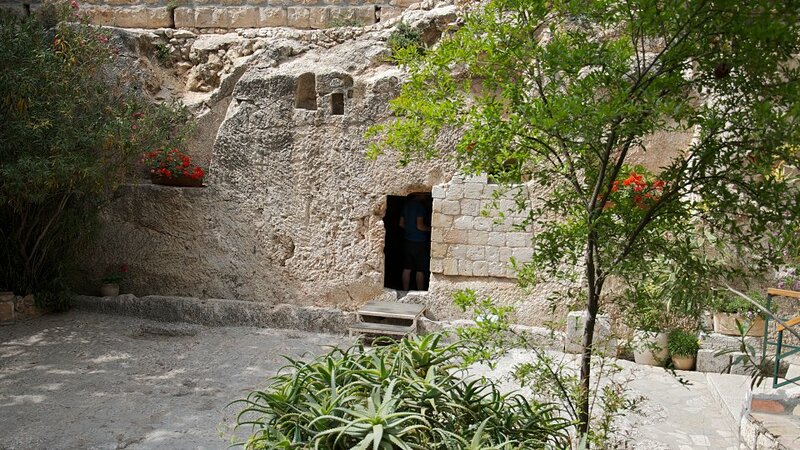 The Garden Tomb is a beautiful, peaceful garden area located just a few blocks north of the Old City of Jerusalem. Also known as Gordon's Calvary, it was identified by General Gordon in the 1880s. It is a possible location of the empty tomb of Christ and has an ancient cistern indicating a garden was there in ancient times and signs of veneration by early Christians. What we do know for sure is that He is not there nor in any other tomb for He is risen! It is a beautiful location for a worship service or the celebration of Communion. There is no better place to sense that God is love than at the Garden Tomb. Seated under a tree with a gentle breeze blowing, it is hard not to be overwhelmed by God's salvation through the resurrection and triumph of his Son. Nothing in the objects of God's love called Him to exercise His love or send His Son incarnate into this world. His love is free, spontaneous, and uncaused. His love is eternal, infinite, immutable, holy, gracious, and sovereign and His love is no better represented than in sending His Son to this earth as an atonement for those who He has called. 6: For thou art an holy people unto the LORD thy God: the LORD thy God hath chosen thee to be a special people unto himself, above all people that are upon the face of the earth. 8: But because the LORD loved you, and because he would keep the oath which he had sworn unto your fathers, hath the LORD brought you out with a mighty hand, and redeemed you out of the house of bondmen, from the hand of Pharaoh king of Egypt. 3: The LORD hath appeared of old unto me, saying, Yea, I have loved thee with an everlasting love: therefore with lovingkindness have I drawn thee. 6: Set me as a seal upon thine heart, as a seal upon thine arm: for love is strong as death; jealousy is cruel as the grave: the coals thereof are coals of fire, which hath a most vehement flame. 7: Many waters cannot quench love, neither can the floods drown it: if a man would give all the substance of his house for love, it would utterly be contemned. 33: Who shall lay any thing to the charge of God's elect? It is God that justifieth. 34: Who is he that condemneth? It is Christ that died, yea rather, that is risen again, who is even at the right hand of God, who also maketh intercession for us. 35: Who shall separate us from the love of Christ? shall tribulation, or distress, or persecution, or famine, or nakedness, or peril, or sword?